Note: You can save $80 by buying two boards. Voila! Your wish is the Blackfin’s command. 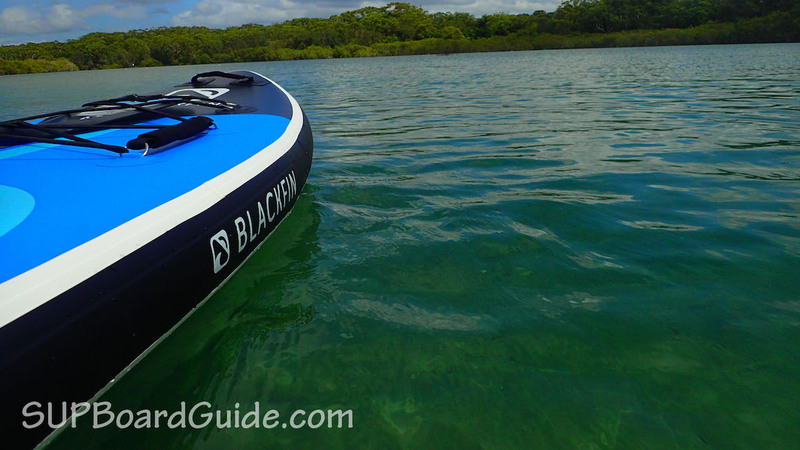 You can use the Blackfin Model XL as a fantastic cruiser or perfect family board. The materials are strong and reinforced with rarely seen carbon rails. The accessories are more that of a high-range ($) board and the design would even make James Bond feel like he needs to up his suave. The company iRocker has been making waves with their SUPs since they started and this is no exception. The iRocker range is awesome and the new 2018 boards are definitely some of the best mid-range boards you can buy. 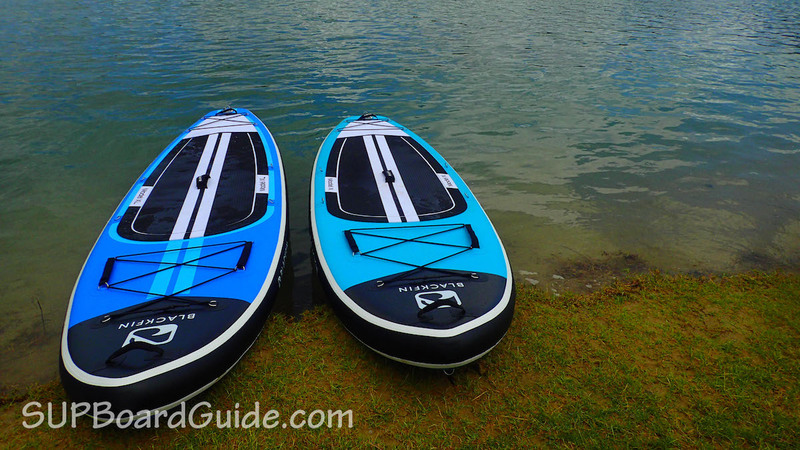 However, the Blackfin Model X and Model XL are more high-end boards and can easily compete with the likes of Red Paddle Co and other top notch brands. Read on further for all the pros (and the reality is a couple of cons) of this SUP. I think I could paddle this one with my eyes closed. I thought the Model X was a stable board. Then I jumped on the XL after and couldn’t believe I was on a SUP. It felt more like a boat. The stable platform did make me wonder about performance though. I was pleasantly surprised by the turning capabilities. It’s got a slim design through the tail that helps boost its performance when turning in a tight circle too. I found it as easy to turn as the Cruiser or the All Arounds. This may also be due to the fins. It’s a little slow on the water compared to something like their All Around. Though not so slow that it takes all your effort to gain any speed. I was able to pick up speed in a few strong strokes and it held it’s line beautifully. What I did enjoy doing was jumping around like a nutbag on it. I put it’s stability to the test by literally jumping up and down like a fizzy drink-fuelled child. I couldn’t believe how much it barely rocked on the water. If you are a beginner, you can’t get anything more stable to start out on. You’ll also feel safe making mistakes. No worries about hitting things, this board is bulletproof. As parents, it’s a big plus being able to bring your kids for a paddle and with 485 lbs max capacity it’s entirely do-able. The guys at iRocker have also put handles on the bungee cord up front with kids in mind. It gives them somewhere to hold on for their safety and your peace of mind. It’s a bit too wide and thick to be tackling waves, you’re more likely to become one with the than you are to carve a face. Unless that is you have some small waves somewhere that it’s a consistent take-off like at point breaks. 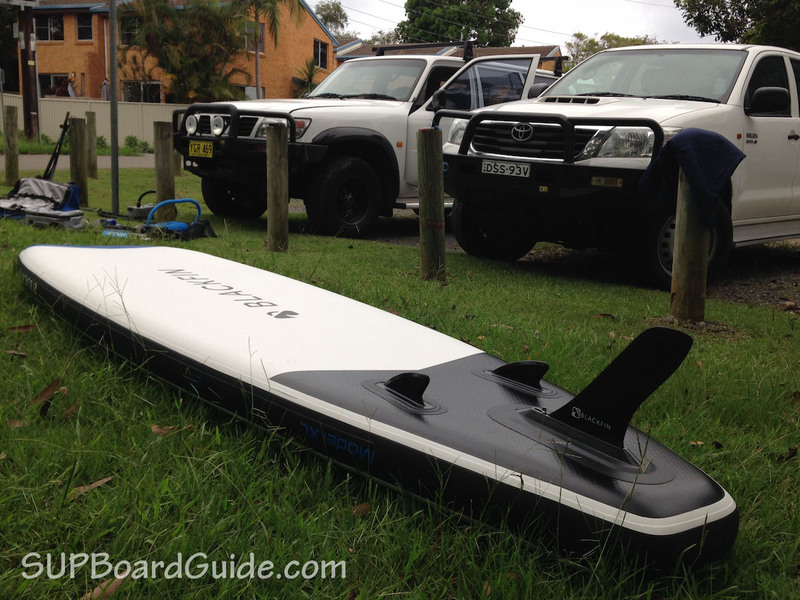 You definitely will love this board for cruising or touring though. As I mentioned earlier it’s not the fastest board but if it’s stability and comfort you are after, then you’ll always need to sacrifice a little on speed. 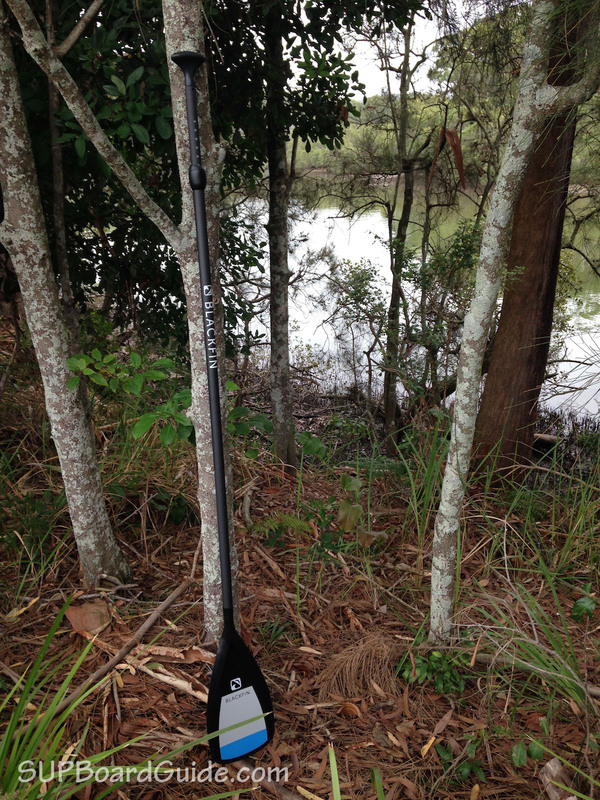 It has heaps of storage on the deck too, so even overnight SUP campout trips on a river are a possibility! If you are super adventurous, you could test your skills on light rapids. There’s easily enough stability and if you remove the large centre fin, it’s tough enough without a doubt. You may find it not as responsive as it’s smaller cousin the Model X though. Depending on who you are (skill) and how intense the rapids are, this may or may not matter. The ideal use for this SUP I think would be using it as a tour/cruiser style of board, especially in areas with submerged objects like rocks and trees. 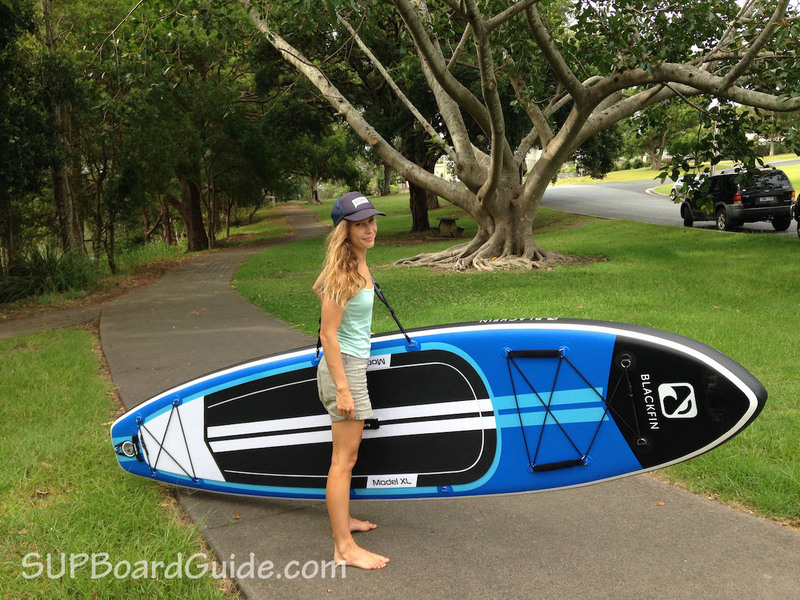 Then it could also double as a yoga or fishing SUP, given it’s 34” width is a perfect platform for both. Family time with your kids or with a pooch would be fun too! As mentioned above this is board is bulletproof. A few factors come into play. 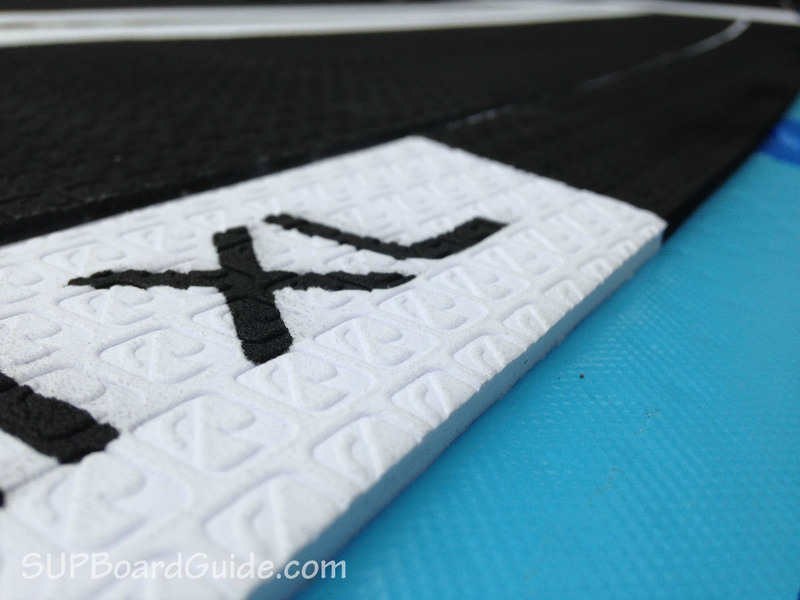 Firstly, is the drop stitch core which gives the board its ability to be inflated to high pressures and increase it’s rigidness the higher the inflation. Drop stitching refers to the technique used between two layers. Thousands of threads are weaved between layers and once they stretch to their full length they just become tighter, improving the rigid feeling beneath your feet. Secondly, layers of military grade PVC are added. In the Blackfin models as well as the 2018 iRocker range, it’s a quadruple layering. On the Blackfin models, the walls are then reinforced with carbon. You can see this in the little windows next to printed “Carbon rails”. The combined rails and 4 layers of PVC makes this board indestructible. Lastly, on top is the deck pad. You’ll notice it’s different to others. That’s because the grip formation is actually the blackfin logo! Which is a cool touch! It’s not as grippy as the diamond pads but it’s more than enough given how stable this board already is. The only part I feel the need to mention that is a downer is the extra weight. The Blackfins are a bit heavier than previous models, but I think it’s justified by the extra performance/durability and extra materials do mean extra weight. Looking at aesthetics, the color is super suave. You’ll definitely standout. It’s also a great neutral color scheme for all types of personalities. This is the first of the Blackfins so perhaps that’s why there is only currently one color scheme, I wouldn’t be surprised if they come out with more choices later on. Another aesthetic appeal is the shimmer that appears on the black nose, sort of makes the board look like it’s wet. I Imagine after a little bit of time, that same shimmer will keep the board looking brand new. Now, let’s play a game! How many D-rings can you spot? 16! Is the correct answer. 4 in the middle of the deck for the optional kayak seat, 6 up front and 4 on the tail with bungee cords on both for storage. The final 2 can be found under the nose on the tail. The tail D-ring is for your leash and the nose for towing. The fin setup is always a point of discussion. Maybe not as a beginner but as you advance, it’s one of the first things you’ll start to notice the difference in. I would love to see this SUP with the option of being purely a single fin. It’s so big and wide that it shouldn’t take away from the stability too much. You also won’t often be taking it in waves or heavy rapids where you want side fins for maneuvering. Being able to use it as a single fin would improve speed. Saying that the current setup is great too. The fins feel strong and the removable centre fin is easily inserted with a screw and plate to secure it. They also have other fin options to best suit your paddling conditions. There’s a 3” for super shallow conditions and 4.6” for shallow conditions but it delivers more control over the board than the 3” Then it jumps up to the 8” and 9” tracking fins for touring. All fins need the screw and plate though. There an FCS fin the Connect II that is compatible with the Blackfin US fin box system that requires no tools. If you want to invest in one of them, it’s a separate purchase outside of iRocker. If you’d like to inflate your SUP which we do recommend you’ll need 5 minutes of your day and your arms. Simple, straight-forward inflate and deflate. To inflate, make sure the pin is in the “up” position. You’ll quickly know if it’s not. To deflate, push the pin in, twist to keep it pushed in and let the air escape on its own for a bit. Then as you roll, keep the pin pushed in and you can push the air out while rolling your board up. The bonus with the Blackfin, so long as you are using the included Blackfin pump is that it’s done in half the time as any other pump. Maybe minus an electric one. Suave as the board itself is the carbon shaft paddle. It’s got the same shiny matte finish like the nose of the boards and printed with the blackfin logo. Makes it looks very professional indeed! Even better it handles like a pro. It’s light at 32 ounces which is 2 ounces less than the other fiberglass paddles iRocker provides! The handle has a nice rubber grip for your comfort. You can adjust your paddle to match your height from the 72” – 86”. Which is helpful if you intend to share this board too. I particularly like the dual-pin lock they use for the height adjustment too. While a simple clasp is quick and easy, sometimes I put it on slightly crooked and my OCD can’t handle it. Here or there it’s okay but if you paddle nearly every day, it gets monotonous finding that perfect middle. If you intend on travel or space is an issue, the paddle will break down into 3 pieces and store away easily. And while it’s being transported or if you use it to push off things, it should stay in good condition. The edging on the blade is built to withstand extra impact. Also branded to match the rest of your gear is the leg rope. It’s lined with a comfortable soft material for your ankle, and there’s a secret stash spot on the end of ankle strap for your keys. If you have a choice, always go with a coiled leash for your SUP adventures because it diminishes the chance of the board snapping back at you if you were to fall off with force. The coil allows the leash to stretch and absorb more of the impact than straight ropes. 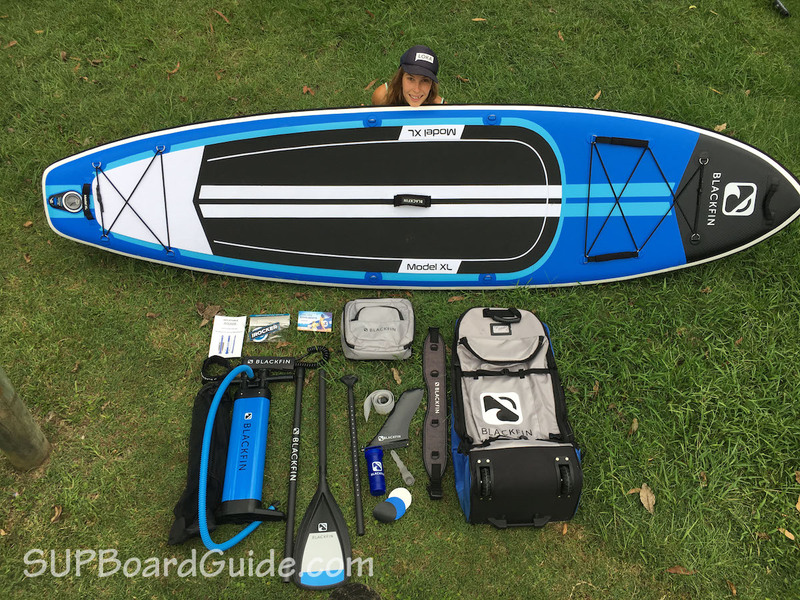 Depending on where you go with your SUP, the bag it comes in can be a huge factor in your purchase. If you live on the water and don’t ever even pack your SUP away, well perhaps it’s not so important. Now if you travel, a bag that’s comfortable to use and that will last should be a priority. Unfortunately, many SUP bags are just for the necessity of including one. Not the blackfin bags though! 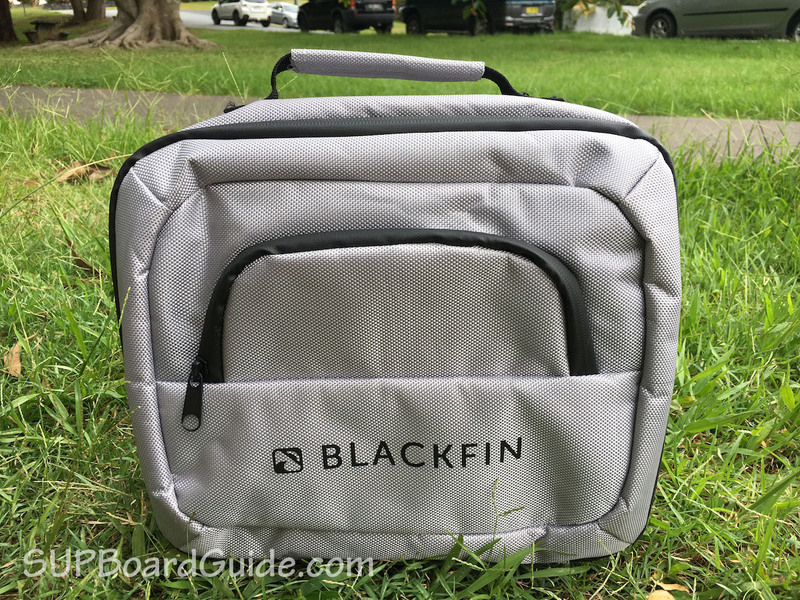 iRocker bags already have a good rep, but these Blackfin bags just blew me out of the water. Get ready for the new improved triple action, high pressure, double chamber pump. It gets the job done in half the time and a minuscule amount of effort. Well compared to other pumps. I still get huffy, but that may be because I’m lazy and use an electric unless I’m reviewing a product. The triple action is clearly printed and numbered so you can easily switch between actions. There is not “set” PSI to switch, just more so when you start to feel it’s too difficult to keep pumping. Obviously the less resistance, the longer it will take, so you just need to find your perfect balance! I like to give pumps a real strong go when I review them so that I can test out the materials they are made with. Seeing as I’m a 55kg girl, I know some of you strong men out there would be pumping harder than I. So if I was to say “it hardly moves under my weight when I push down!”, you may then call me a liar. I put on my hulk mask and go for it. This pump withstood its test. Felt super strong and rigid through the base and up to the handles. I can’t stress enough how good this pump is. The only comparable pump that is included with a board is Red Paddle Co’s Titan pump. And Red Paddle Co boards are about twice the price of a Blackfin…. 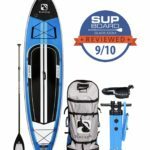 Kayak Bundle – A nice addition to the Blackfin bundle compared to the iRocker is the bag on the seat. 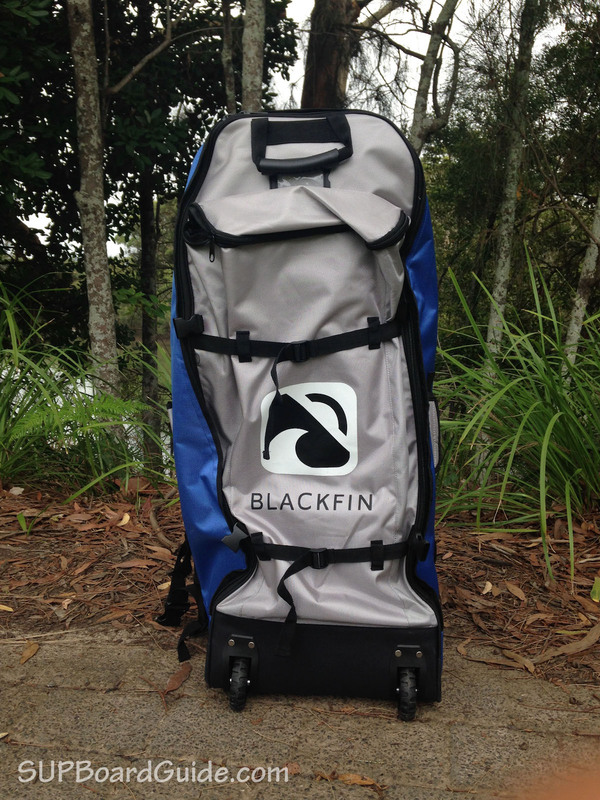 The Blackfin kayak seat has a bag on the back for extra storage and easy access. Then also the paddle is a carbon shaft. This kayak bundle is a perfect accessory to really make the value of your purchase stretch! Cooler Bag – Easily attached to any bungee area is the cooler bag, It’ll keep any snacks fresh and dry – so long as you don’t completely submerge the bag! It’s perfect for long trips to store water, food or puppy treats! Detaching can be finicky but that’s kind of what you want/need. Carry Strap – For those who find it difficult to carry boards, perhaps smaller riders, then the strap could be for you. 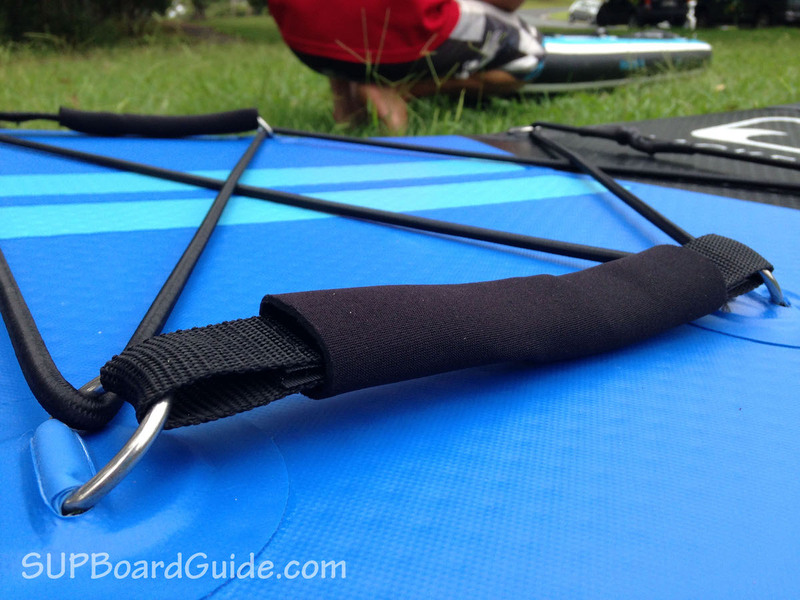 It attaches to the middle D-rings on the board and is seriously comfortable. The underside of the strap is a soft rubber, so there’s no chafing or digging into your shoulder. This is possibly the perfect family SUP board. It’s got a huge weight capacity, is extremely wide so therefore stable with extra passengers and even has those handles on the nose for your kids to hang onto. 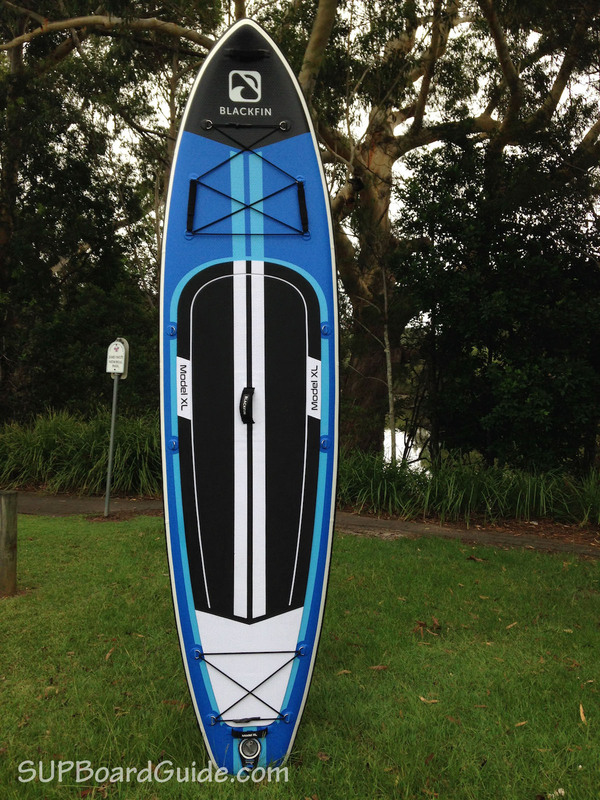 But also an ideal fishing SUP or even just a general cruiser. If you’re looking for speed on your tours but still need stability, you’re better off looking at the All Around. If you are worried about the weight capacity, the 11’ All Around should be good for you. Now, if you want a sturdy board that you’ll have no fear bouncing off objects with, something that can hold LOADS of weight but still performs as well as other boards in the iRocker range. 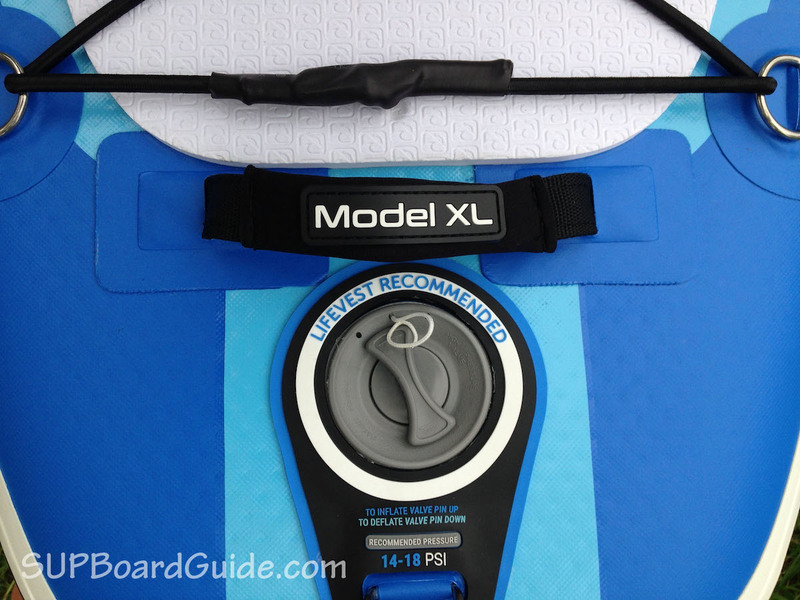 the Blackfin Model XL should be in your trolley. The Model X is much the same but less capacity and little less stable (still one of the most stable SUP’s I’ve ever been on) but then, of course, has more speed and maneuvering qualities. If you’re looking for a fast and sporty board the iRocker Sport is the one you definitely want to consider. For an affordable price and high-quality accessories to go with that cost, it sort of gives you that feeling of “okay what’s the catch”. I think that iRocker just is a passionate company. They care about their products and their customers. They’ve always been a fantastic bunch to deal with. They also will stand behind their products with a 2-year warranty! 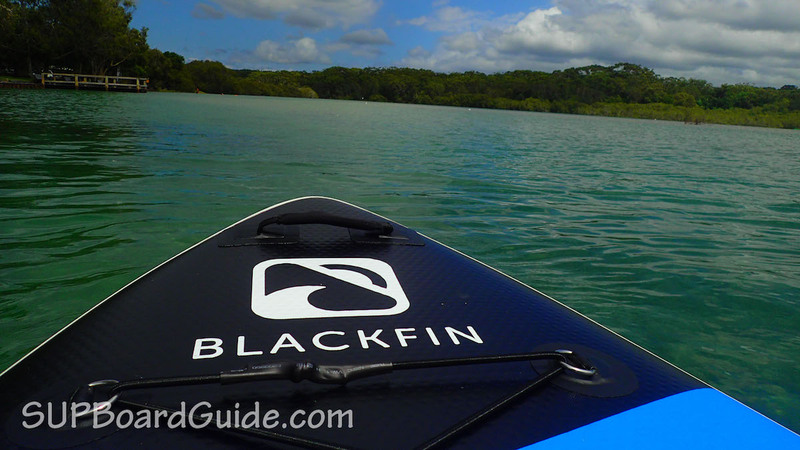 We definitely feel confident saying that Blackfin boards currently offer by far the best value for money. Please let us know if you try one out and what you think! 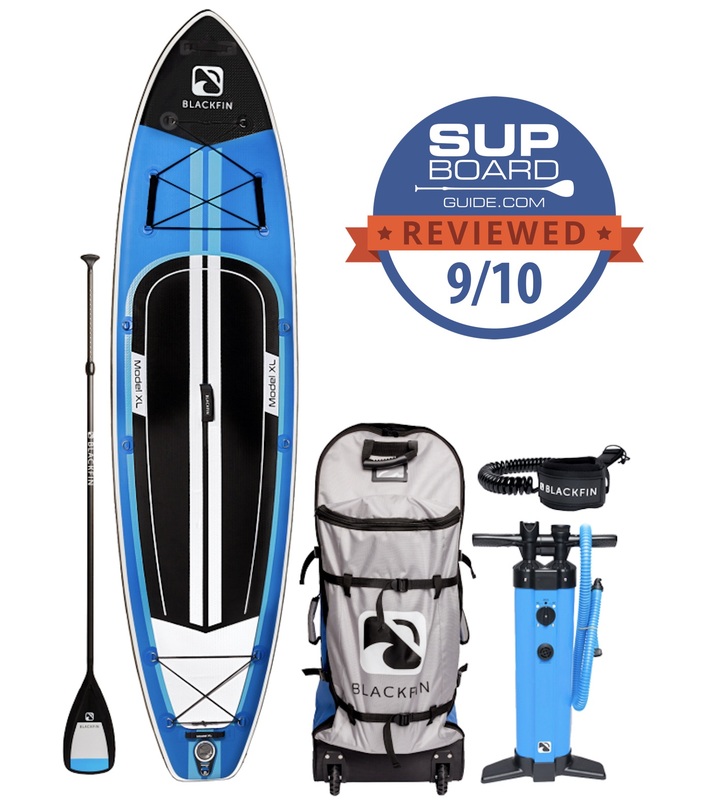 I am using an irocker sport 11 (1st generation) at the moment which i like but the paddle, backpack and so on are not that great so i feel like seeling and buy a blackfin Sup instead. I like to sup with my kids a lot (boy 3 and girl 5 years old) and my daughter is starting to sup at her own. Do you see any advantage from the model xl over the x? Or would u say the blackfin sups are too heavy for kids to push on the water? Usually we only sup at lakes so waves are not a big deal. Thanks for any advice u may have. the 1st Generation of iRocker boards was great but they’ve definitely upgraded and changed a lot of things! 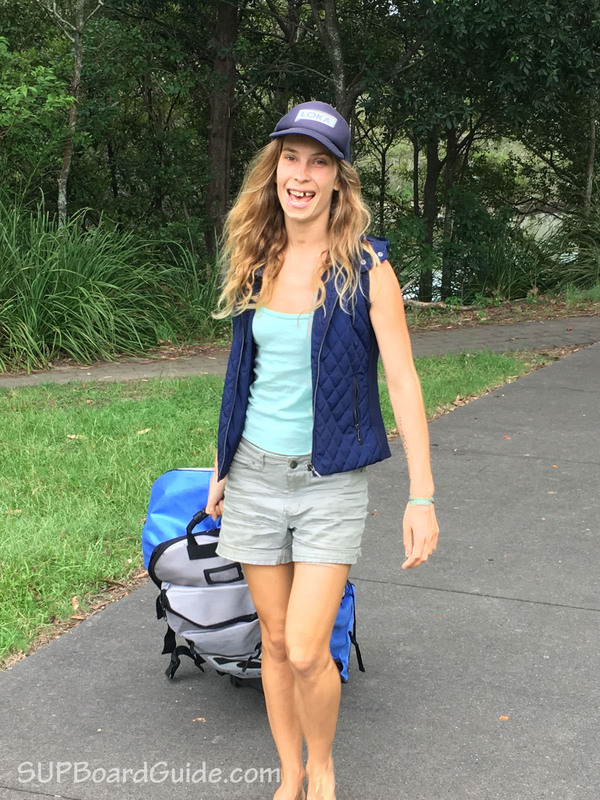 The new generation Sport has a new backpack and paddle. Both are significantly better than the previous one. 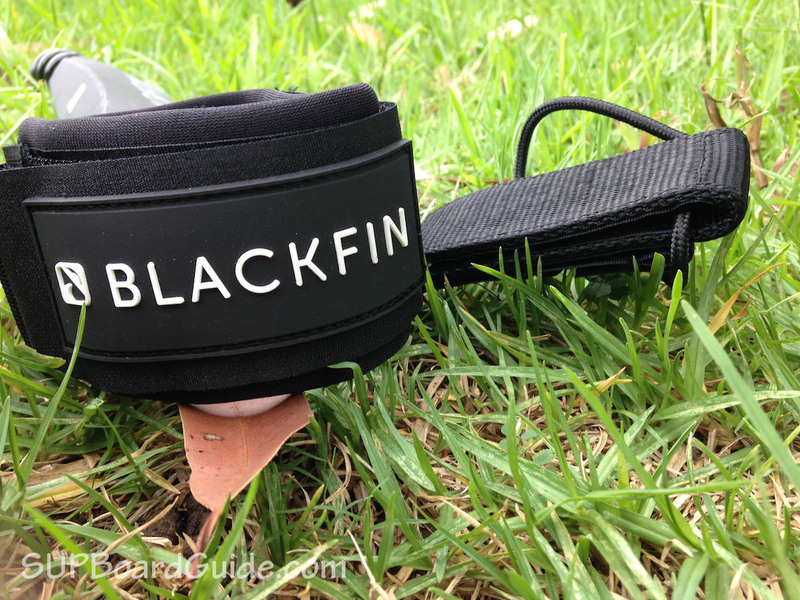 Blackfin boards come with even better accessories. The backpack is outstanding and the carbon paddle is really nice as well. It’s also a perfect family board. You can have both your kids on board at the same time and won’t have any issues. Since your previous board is the Sport I’d go for the XL though. It’s obviously not as quick as the Sport but still a little faster than the Model X. It is a fairly big board but it’s really been designed as a family board. Your 5-year old will have some fun paddling it. She won’t be breaking any speed records but that’s not really what it’s all about. I currently have a peak… so far it hasn’t popped. We will be getting an 11’ all around and I’m stuck between the Blackfins x vs xl. I’m a big girl- 5’10 220# I hate falling and generally sup on my knees. Looking to start standing. Possibly fishing from the board and will be purchasing a kayak kit. The Blackfins is for me as I want the stability. If I’m not using the board my kid and his friends will use it. We travel with our boards. Generally small lakes the Mississippi and to the ocean over spring break where we use it on calm or small waves. the All-Around is a great choice. Both the X and XL are similar. They’ve been designed with stability and family in mind and not to win any races. Sounds like they are perfect for you. The Model X is an inch wider than the XL. That makes the XL a little faster since you get more glide. I’d say the XL is better if you’re interested in covering longer distances as well and want the perfect cruiser. It sounds like the Model X is would be the better choice in your case. It gives your kid plenty of room to play on and it’s still maneuverable for kids as well. It’s also great for fishing. You have sort of answered my question in your responses to others. . . I think, but I’m not sure . . . 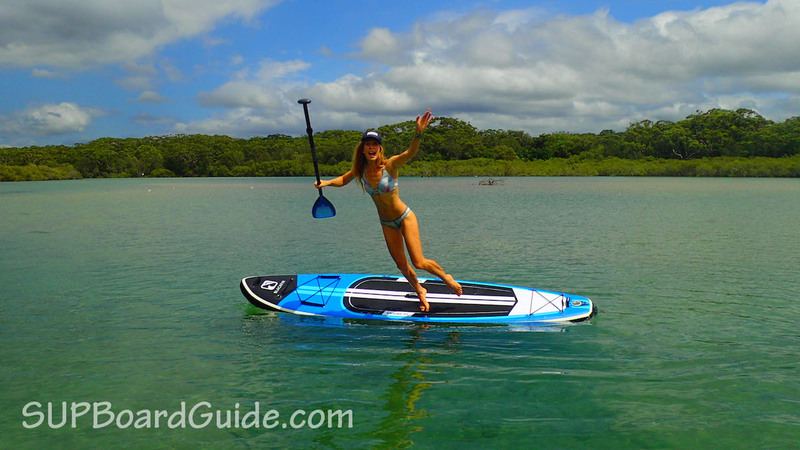 I have ridden non-inflatable paddle boards and now want to get an inflatable board. I have done a lot of research, and I first narrowed things down to Tower, iRocker, and Blackfin and then down to Blackfin X or Blackfin XL. I would like to get a board with the best combination of stability and maneuverability. I am 5′ 10″ and 180 lbs. I live in Colorado and mostly paddle on lakes and fairly slow moving rivers. Sometimes I take my 45 lb dog with me. Occasionally, I fish from the board. Thoughts on the best board for me? Thanks. If it’s between the Model X and XL, I’d say the X is plenty enough for what you after and if you purchase the kayak seat, you’ll be set for fishing! There’s also so much room for your dog and the shape of the board means weight is reasonably evenly distributed so *fingers crossed* it won’t be too wobbly! The only bummer of the Blackfins is they are a bit heavy to lug distances. So long as you’re take off point isn’t too far from the car you’ll be stoked! 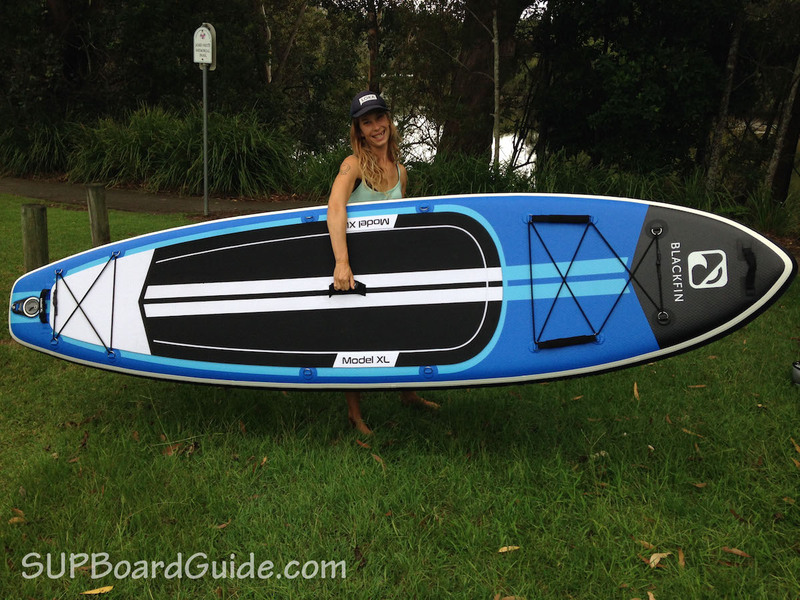 Hi, I’d like to know where can you get a blackfin sup I. Australia the website only shows 4 of the irocker boards but none are blackfin, can you not buy them in Australia? They aren’t currently selling them in Australia 🙁 We will be sure to let everyone know when they are though! 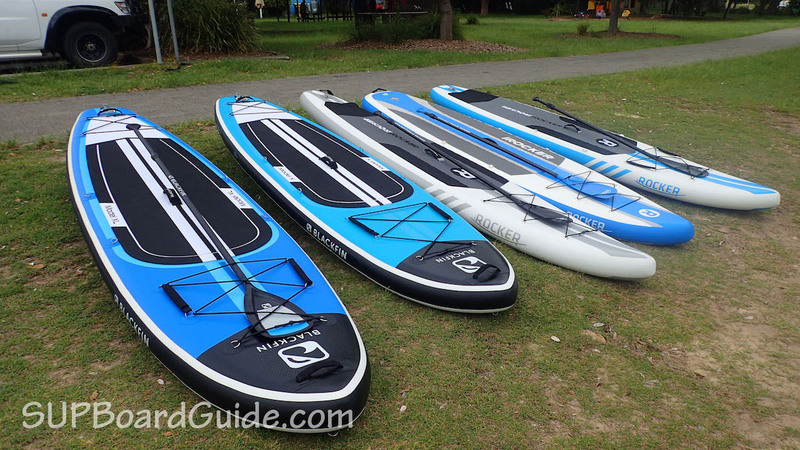 There is a company based out of Sydney, BaySports that I’ve recently reviewed a few of their boards. Perhaps any of them would be of interest? I highly recommend them!! Currently the 2018 Blackfin XL is $675 and the 2019 is $849. Do you think the improvements on the 2019 justify paying $174 more? I do like the removable small fins and the lighter weight…the strap in the back for a kid is nice too. the 2019 model comes with a few new features. As you’ve mentioned, it is lighter making it slightly faster and easier to paddle than the 2018 model. You’ll mostly notice the difference when you carry the board though and not so much on the water. The high weight was definitely one of the cons last year and I’m glad iRocker managed to decrease the weight. They also added an action mount and a bunch of handles/D-rings. The D-Rings in the back can also be used to tie down a cooler for longer trips. The side fins are now removable so you can change your fin setup depending on the conditions, making the board more versatile. One of the major changes to keep in mind though is the new pump. The old Blackfin pump was amazing and one of the best in the industry already. The new one is even better and significantly reduces the time/effort it takes to inflate your board. It’s also 1.5 lbs lighter than the old pump making the backpack even lighter. So is it worth the extra $174? It’s really up to you. If you only have to carry your board a few meters from your car to the water and if you use a compressor to inflate it anyway, I’d say go for the old one. If you think you’ll be carrying your backpack for longer distances and if you inflate your board using the pump regularly, I think the lighter weight and better pump will come in handy for sure.